From now on don’t bin your leftover hard cheese rinds (especially from parmesan). Just freeze them and use them to jazz up your hearty soups, sauces, stews and everything that you’d normally use parmesan cheese for. 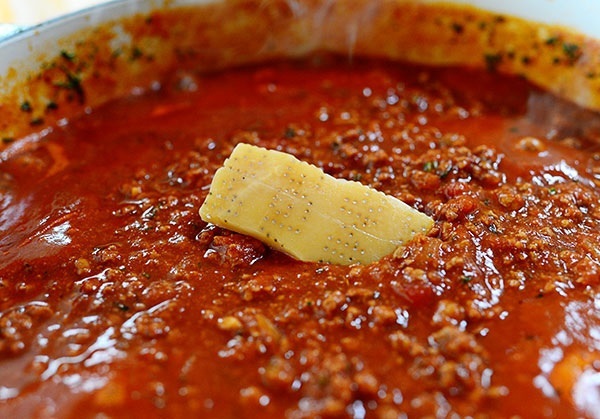 Somehow if you stick a cheese rind in a pot of soup or a spaghetti sauce while cooking it, it will transform your regular dish into a deeper and creamier pot of goodness. Try it! Also, we just discovered this little dipping sauce recipe for fresh bread: put your rind in a jar and add a slug of good olive oil and a clove of garlic. Let it sit for a few hours and start dipping your bread. So good! P.S: Also, this ginger peeling trick and 4 awesome apple tricks. P.P.S: The best way to keep lemons fresh for up to 5 weeks! I love this! Can I use this a guest post for tablesandthyme.co.za? Jill, you will love this! They make everything taste so much better.